Viewers will also see special messages submitted by eight presidential candidates who responded to the question: "What do you see as the greatest threat to religious freedom in America today and what will you do as president to protect our First Freedom?" The special broadcast will be filled with stories of individuals who have been tested and have stood strong for their religious freedom. “Religious liberty, the church, and our core beliefs have all been frayed by the words and deeds of this administration. As Christians, if we don’t have the freedom to live according to our faith -- whether it's in the home, the workplace, or in school -- then religious liberty is a meaningless phrase. 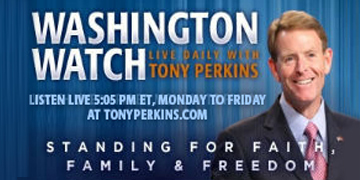 I'll be talking with individuals, pastors, and Culture Impact team leaders as they share the urgency to stand up and defend religious freedom,” Perkins concluded.